Another bean is on the agenda this week. This time I’m talking about mung beans. Mung beans, from my perspective, are rarely used in American households (they certainly were in mine) and it’s a shame. 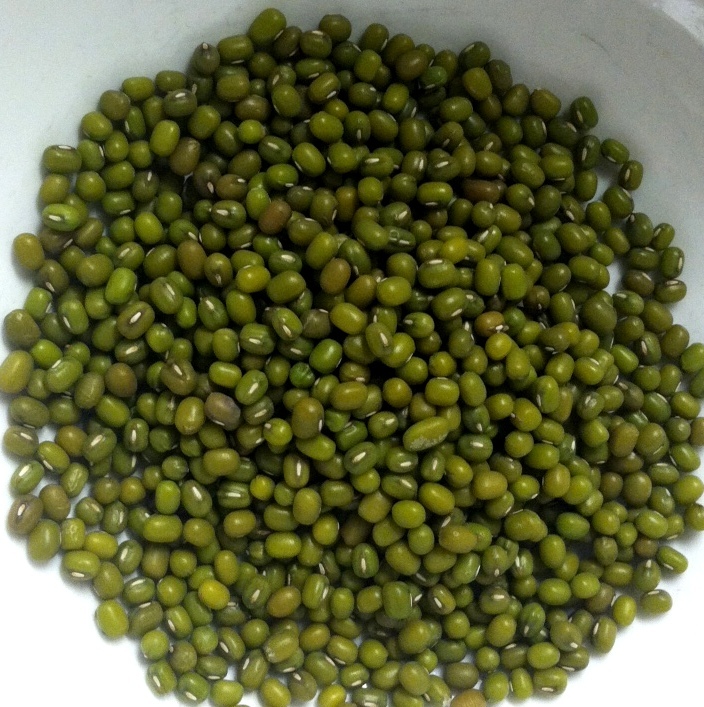 Well, mung beans (also called moong beans) are fantastic. I knew next to nothing about these tiny green/yellow legumes when I set out to cook with them, but I quickly learned that they are incredibly versatile. 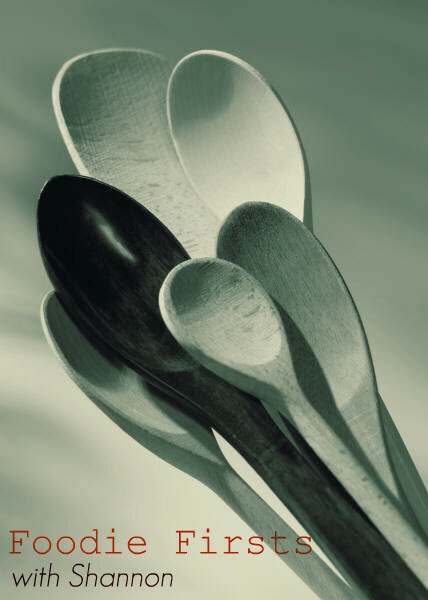 Quite frankly, given how many things you can do with them, I’m surprised they are not more of a kitchen staple. Maybe I need to start a ‘Eat Your Mung Beans’ campaign. Mung means can be made sweet or savory, cooked whole or broken down, turned into dal or bread, sprouted, or broken down into a paste. Clearly, they are flexible little things. I obviously didn’t have time to try all of these manifestations for today’s post, but I did decide to commit to trying mung beans in two different preparations. 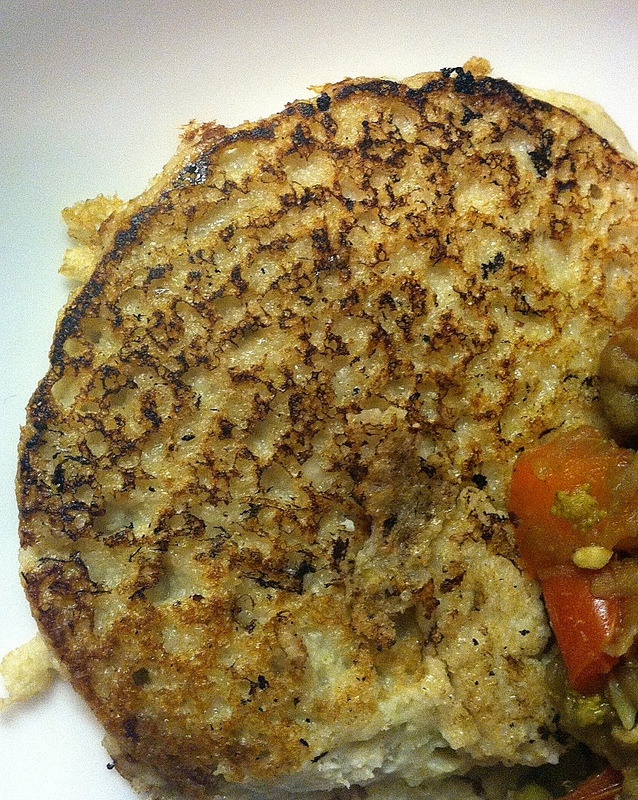 I went with a basic savory dish and also tried my hand with bread making in the form of dosas. Of the two mung bean dishes I tried, one was successful and one was . . . not so successful. Why don’t we start with the good news first? I decided to combine some of my mung beans with lentils and prepare a dal, as this is one of the most traditional uses of this ingredient. Also, dal is delicious and I’ll eat it pretty much whenever I can. So, there’s that. 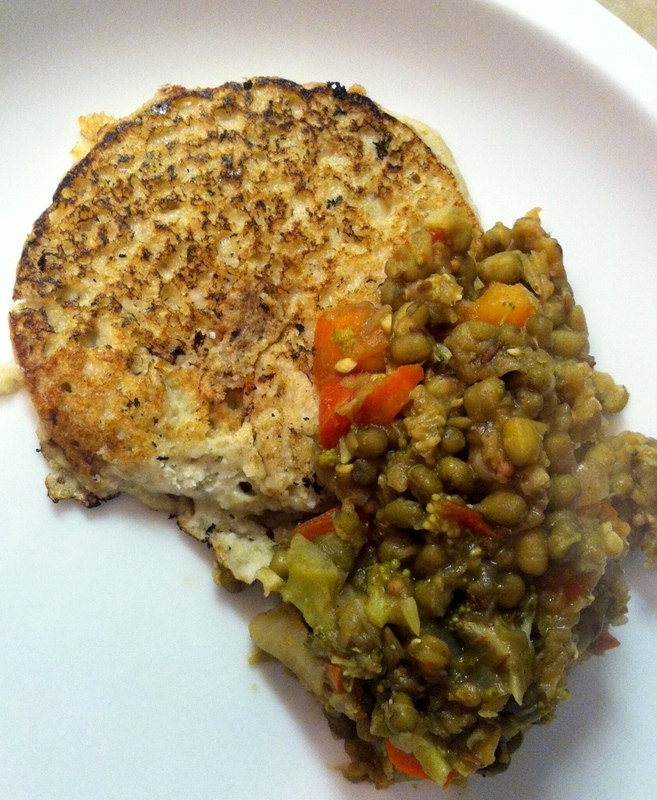 I loved the mung beans this way and found them incredibly easy to work with. 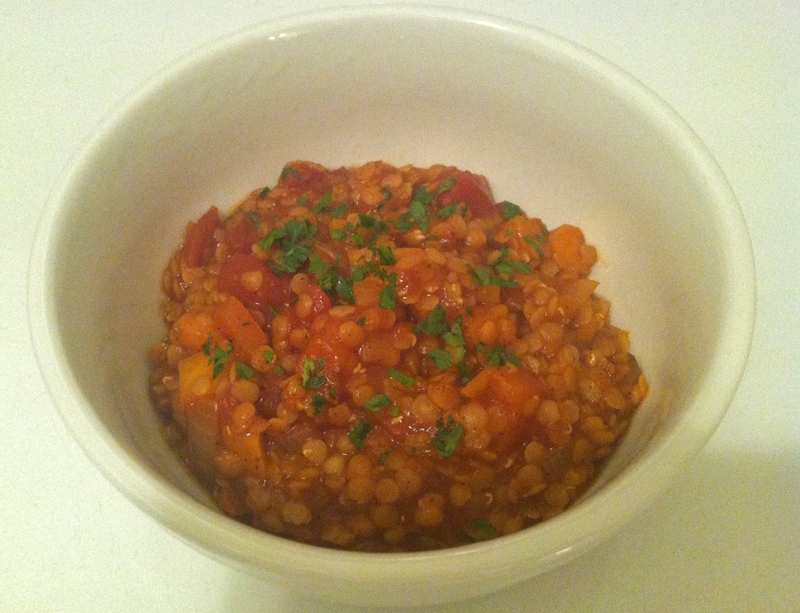 They partnered well with the red lentils and created a tasty and satisfying dinner. I’ve seen mixed notes on whether or not mung beans need to be soaked overnight (as you might with other dried beans). I’m sure you could do so, but I will say that I skipped this and they cooked up wonderfully without any soaking whatsoever. As for the dosas . . . well, I will try them again. In all honesty, I think the problems I had with them were entirely my fault and not the fault of the recipe or the ingredients. I had never eaten nor prepared any type of dosa before, so it was a new process. They actually had good flavor, but the thickness, size, and texture was off. Dosas are meant to be large, thin discs of bread, but my batter didn’t seem to spread very much and instead of forcing it to, I just went forward and made them thicker than they should have been. The result was disappointing, as they didn’t fully cook through well and had an undercooked, too doughy consistency in the middle. In the future, I think thinning the batter a bit with water will be necessary. Yet another cooking lesson learned, I suppose. Regardless of my less than stellar dosa making skills, I’m definitely pro-mung bean. I’ll be adding them into my repertoire and will likely swap them for lentils from time to time to add a bit more variety in my kitchen. Serving Suggestions: I highly recommend going the traditional route and using mung beans to make a dal. Use your favorite dal recipe (there are plenty out there) or try this one here, which I used as a basis for the one I made. I also just saw this blog post pop up from Heidi over at 101 Cookbooks and think a mung bean hummus is a wonderful idea. Get sprouting! I haven’t sprouted my own beans yet (maybe this is a future endeavor for me), but I know enough to know that it can be done in any home kitchen. Sprouts are delicious added to salads and wraps and I especially love the crunch they give to a good stir fry or bowl of noodle soup (like pho). Lessons Learned: The world of beans is an endless bounty of delicious and nutritious foods. A different variety exists for even the smallest preferences in color, texture, size, and taste. I love this. When I think about how many times, since becoming a vegetarian and switching to a mostly whole foods/minimally processed foods diet, I have read or heard others ask the inevitable questions about my ways of eating (You know the ones: Where do you get your protein? What do you possibly eat as a main dish? Do you just eat salads all day? ), I have to laugh and think about things like this. I understand the questions – really I do. I would have asked them once, too. But, it’s funny to me now. All the foods I have discovered in the last year, the delicious dishes I have savored, and the ingredients I have become infatuated with have only broadened my culinary world – not limited it. I’m starting a new journey today. Or maybe it’s more apt to say I’m returning to an old one? I work in human services and for the last year and a half I’ve worked to provide services for seniors and people living with disabilities. Prior to this role, though, I worked for about 7 years in domestic violence advocacy. I loved doing anti-violence work. I have a tremendous amount of passion for it and, frankly, I thought I was pretty good at it. Plus, the women (and men, but mostly women, if we’re honest) that I got to know in my years doing that work are incredible, both co-workers and program participants. You see some amazing spirit and humanity in that work. When I left it a year and a half ago, it was one of the most difficult decisions I had to make. I left for a combination of reasons. As much as it pains me to admit it, one of the biggest ones was money. I don’t work for money the way some people might, but I was flailing with debts racking up, student loan bills growing, and my weekly paychecks stagnantly low (I could write a tirade on the pay rates for people who do that and similar work, let me tell you). It wasn’t sustainable and I needed to make a move to keep from drowning. I looked outside of the field, at other focuses within human service work that might allow me to create a more stable economical platform with which to build my life on. I ended up landing the job with seniors and people living with disabilities. The financial change was significant and I’ve learned a great deal of valuable information about systems I didn’t know much at all about before, but the truth of the matter is that it doesn’t ignite the same fire in me that my old work did. But sometimes careers take interesting turns. The job I’ve been in is part of a larger entity (a government entity, to be precise) and one very small part of that entity is a unit that does domestic violence work. When I saw a rare opening posted in that unit, I didn’t have much expectation it would pan out, but it has. So, today, I return to familiar work, in a new environment. My work will be less direct service than I did before and will involve more time spent supporting others who are doing direct service work. I’m pretty excited about it, really. I get to return to a field that really matters to me, maintain a sustainable income, and put a new spin on work that I feel really comfortable doing. I hope it’s not too good to be true! Now, let’s get on to the recipe. For me, this recipe has some of the same qualities as what I am experiencing with this job change. This dish is warm, comforting, and something about feels familiar despite this having been the first time I’ve made it. Yet, it’s also kind of new and exciting. The brightness from the lemon adds a zing that contrasts (but harmonizes with) the hearty comfort of the dish. I loved eating this fresh from the oven and for leftovers throughout the week. Preheat oven to 350 degrees. 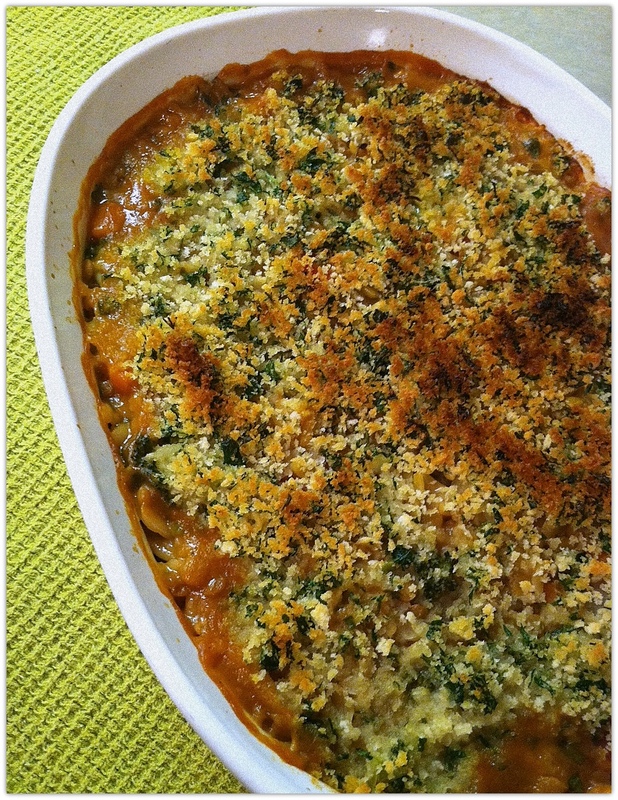 Prepare a 3-quart casserole dish by coating lightly with cooking spray. In a Dutch oven or other large pot, heat ½ tblspn olive oil over medium heat. Add onions and carrots to pot and cook until softened, about 5-7 minutes (stir often). Add garlic and red pepper flakes and cook, stirring almost constantly, for 1 minute. Add lentils, thyme, and basil to the pot and stir to distribute. Add broth and lemon juice. Bring mixture to a simmer. Then, reduce heat to low, cover, and simmer for 20 minutes. After 20 minutes, add in the chopped broccoli and stir. Re-cover and let broccoli soften 2-3 minutes. Remove from heat. Add to pot the lemon zest, the drained tomatoes, orzo, salt, and pepper and stir until everything is well combined. Pour all contents into the prepared casserole dish. 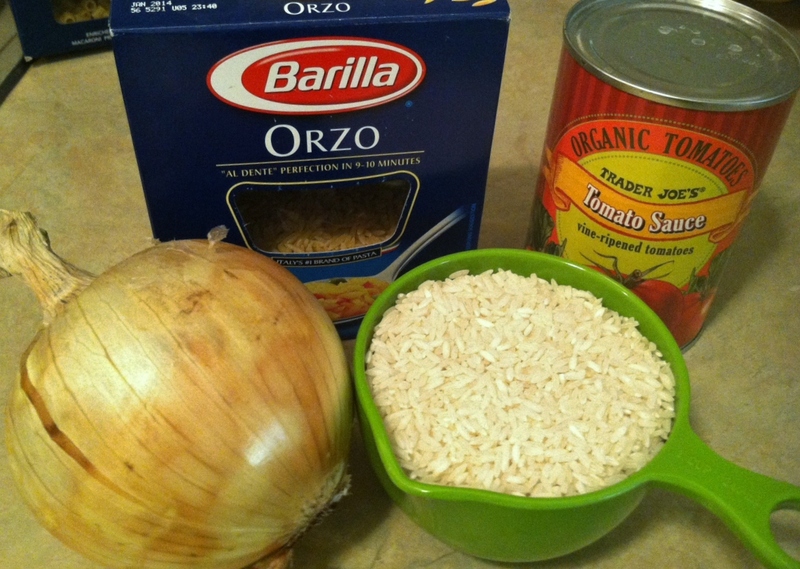 If needed, pour just enough hot water over mixture to ensure orzo is covered with liquid. Cover with foil and bake in preheated oven for 20 minutes. Meanwhile combine the breadcrumbs, 1 tblspn olive oil, and parsley in a small bowl. Mix well. After the first 20 minutes of baking, remove foil and sprinkle breadcrumb mixture evenly over the top. Return to oven and bake, uncovered, for 20 more minutes. Let sit 5 minutes or so before serving. In the weeks leading up to my first half-marathon, I spent quite a bit of time reading and planning for how I would prepare. What would my taper look like? Should I have a pre-race meal 2 hours or 3 hours beforehand? And, of course, there was the question of what to eat the night before the race. Since I wasn’t running a full marathon, heavy carbo-loading wasn’t necessary, but I did want to increase my carbohydrate intake somewhat in the days leading up to the run, just to be sure I had the stored energy that I would need. I also wanted to eat something familiar and delicious; something that I knew would provide me with necessary nutrients, as well as comfort to calm some of my nerves. It didn’t take long for me to decide on koshari as my pre-race dinner. 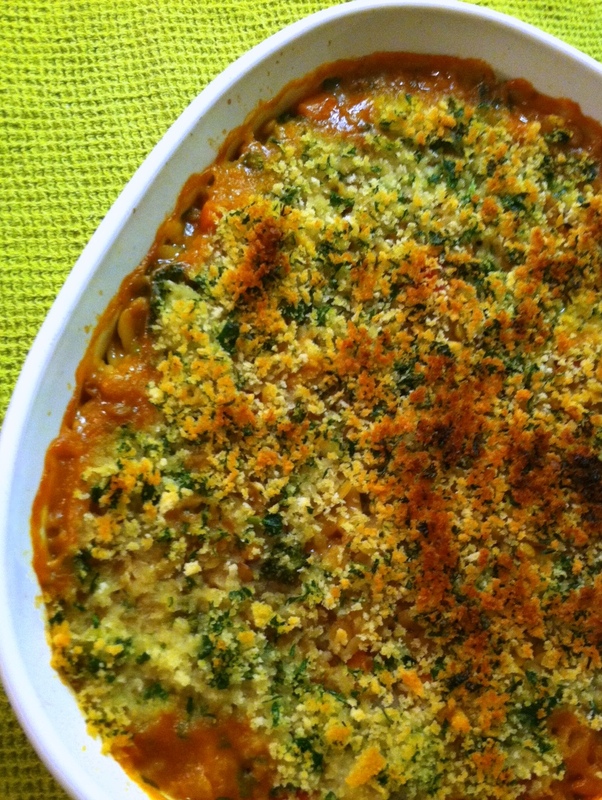 Many runners turn to pasta dishes before runs. Whether it’s a group of runners gathering together or a quick meal at home, pasta dinners have long been a tradition before races. Koshari is a take on a pasta dinner, but with a decidedly different cultural twist. As I understand it, koshari is Egyptian in origin and is a traditional mixture of pasta, lentils, and rice with a somewhat spicy tomato sauce and onions. I’ve seen several different recipes for koshari and the one I will share with you here is the one I have created from a culmination of various sources and my own trial and error. 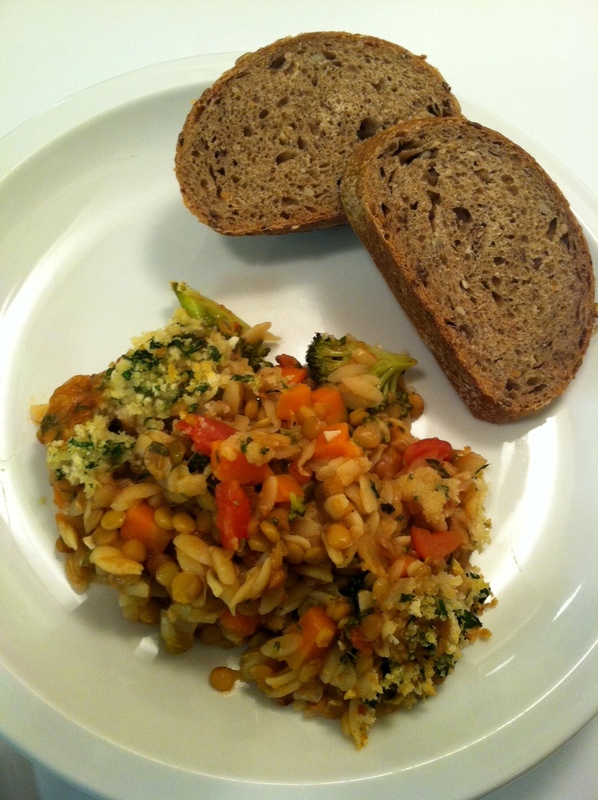 This is a simple dish, but it is consistently one of my favorite and most satisfying meals. I also like to think that it really is ideal to include in a healthy menu for runners and other athletes, as it packs a nice combination of nutrients. The pasta and rice give you the carbohydrates you need for sustaining energy levels. The lentils provide a substantial dose of protein, fiber and B vitamins. The tomato sauce delivers powerful antioxidants and a good amount of potassium, and the onions provide protection for your heart, as well as overall anti-inflammatory properties. How perfect is that?? Plus, this stuff is good. Place lentils in a pot with 3 cups of water. Bring to a boil, cover and simmer about 30-40 minutes, until tender. Drain and set aside. Simultaneously, cook rice in 2 cups of water as directed on package. When finished, set aside. Also, cook pasta until al dente. Drain and set aside. Saute onions, garlic and chili in olive oil until browned. Add tomato sauce, red pepper flakes, and red wine vinegar. Heat to boiling and reduce to a simmer. Add salt and additional red pepper flakes to preferred taste. Simmer for 3-4 minutes. 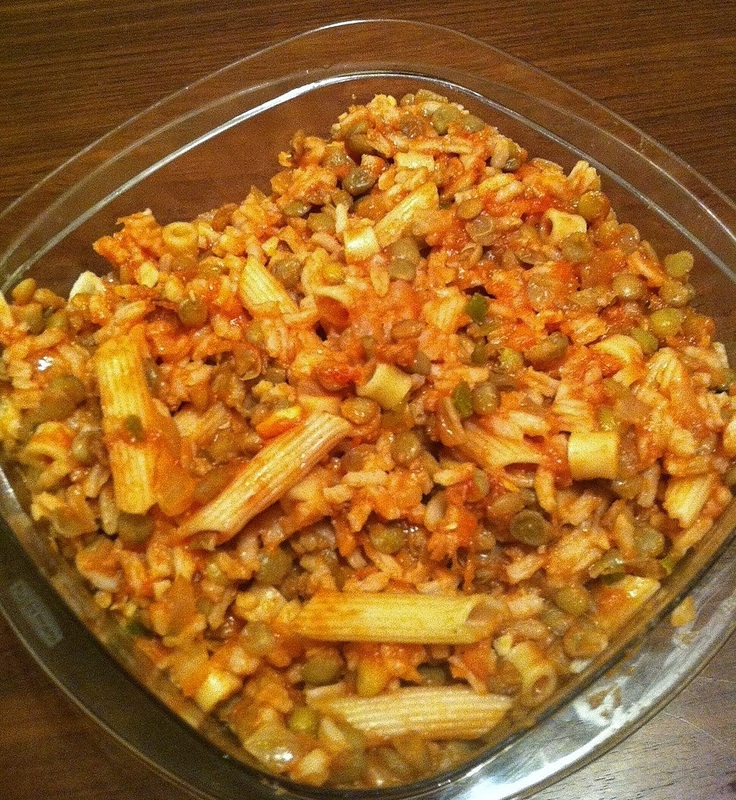 Combine cooked lentils, rice and pasta with the sauce and mix to combine. If desired, serve topped with caramelized onions, chopped parsley or cilantro. I’ve discovered a great many wonderful foods in my adult life that were foreign to me as a kid. Arguably one of the greatest discoveries is lentils. I love lentils. French lentils and red lentils and brown lentils and whatever kind of lentil you can put in front of me, I will surely like it. 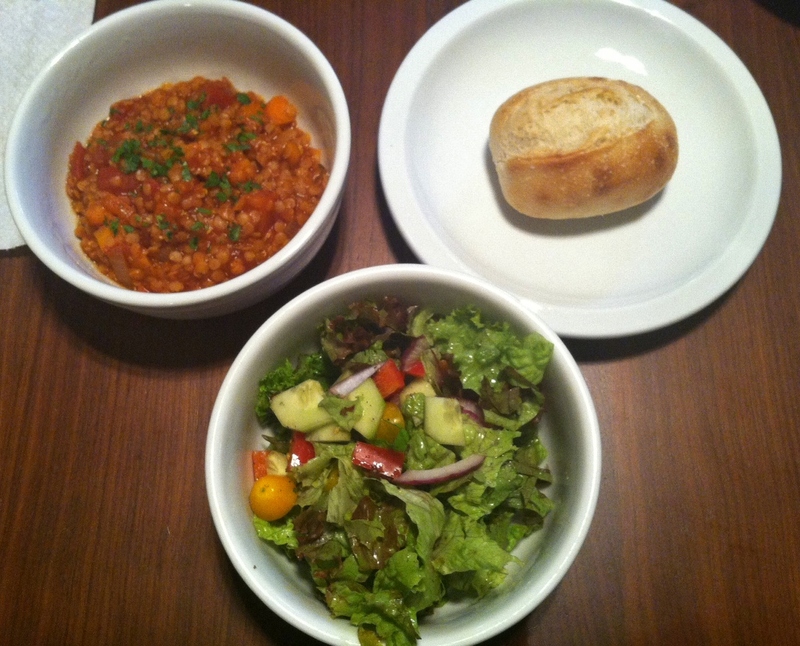 Healthy, hearty, budget-friendly and so very versatile, lentils are eaten a lot in my home. This dish uses red lentils (so often used in dals and curries) and turns them into a spicy, Mexican-inspired chili. Similar to lentils, chili is another thing eaten often in my home. Most often, though, our chili dishes feature beans (a fine choice, don’t get me wrong), so using the red lentils to create this chili was a fun and slightly out of the ordinary way to create this meal. The heat can be easily adjusted up or down on this to your preference. Want more? Add a hot pepper to the mix. Want less? Skip the crushed red pepper flakes. Easy, peasy adjustable spice quotient. By the way, this made really good leftovers, too. If you like that sort of thing. Warm oil in a Dutch oven or other large pot over medium heat. Add carrots, onion, bell pepper, and garlic. Saute vegetables over medium heat, stirring frequently, for approximately 10 minutes, until the carrots begin to soften and the onion starts to brown. Add cooking wine (if using) and vinegar to the pot, stir cook for 2-3 more minutes, until the liquid is cooked down. Add in all dried spices and herbs. Stir and cook until all vegetables are coated with the spice mix, approximately 1 minute. Add lentils, broth, diced tomatoes with their juices, and tomato paste to the pot. Stir until all ingredients are incorporated. Bring mixture to a boil. Cover, reduce heat to simmer, and cook for approximately 20-25 minutes, stirring occasionally, until the lentils are cooked through. Uncover and check for done-ness and liquid absorption. If preferred, continue to cook uncovered for approximately 3-5 minutes in order to give excess liquid time to cook off and make a thicker chili. Top with the fresh parsley and serve.